Flap copy: A slamming door may not seem like a big deal, but in this hilarious story of cause and effect, it can have far-reaching consequences, including a limping Pa, a bee-stung bear, and a house plunged into chaos! 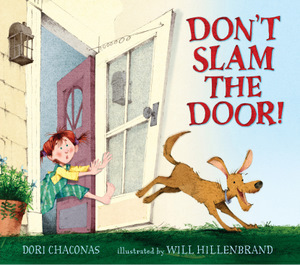 In lively rhyme that's perfect for reading aloud--illustrated with cozy, homespun artwork by Will Hillenbrand--Dori Chaconas relates a humorous tale of a pint-size narrator who tries valiantly to warn her family of the increasingly outrageous effects of their actions. Behind the scenes: I came from a HUGE family with cousins here and cousins there and cousins everywhere! There was nothing better than when any of the cousins came to visit! Kids ran in and kids ran out, and the old screen door banged, and banged, and banged! It was a welcoming sound, filled with the promise of fun, games, stories, and excitement. This book is dedicated to my family and to families everywhere who enjoy the warmth of gathering together. Our Pa has had enough. This whole ordeal's been rough. So bring his fishing stuff.